If you are walking with your dog and he/she get bitten you will normally be alerted by a yelp or scream. 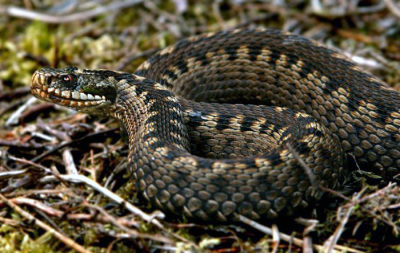 Adder bites normally result in A VERY PAINFUL LOCAL SWELLING and salivating. There may be a visible puncture at the site of the bite. Dogs commonly get bitten on the legs as they walk past the adder or on the face as they use their nose to investigate. If you suspect your dog has been bitten by an Adder seek veterinary treatment immediately. Do not allow your dog to run, if far away walk slowly.